Gedoestia hassleri is better known as ‘Uitpeuloog’ , ‘Ophthalmomyiasis’ or‘ gedoelstial myiasis’. 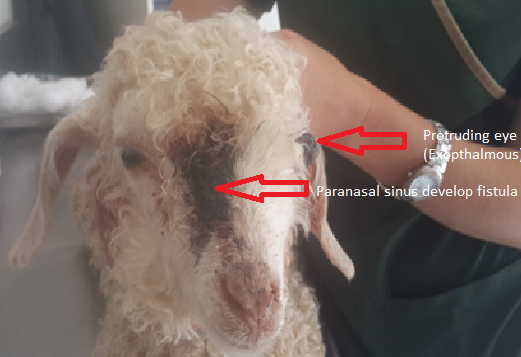 Cases of Gedoelstia are rare but a suspected case has been diagnosed in an outbreak in a flock of Angora goats in the Pearston district in March/April 2016. Angora goats are not preferred hosts. The usual incidence is over the summer months October to May but larvae have been recovered throughout the year. Peak incidence of the disease is February to May. Blue and black wildebeest are the preferred hosts of larvae of this fly but they also infest hartebeest, blesbuck , tsessebe, blesbok and bontebok. No clinical symptoms are usually detected in these hosts. With the increase in the number of game farms in the Eastern Cape outbreaks may become more common. Flies belonging to this genus deposit larvae on the cornea or conjunctiva of the eyes of their hosts from where they migrate either via the optic nerve tract or artery to the subdural cavity and dura mater, and then via foramina in the cribriform plate and other foramina to the nasal passages and paranasal sinuses. They use their mouth hooks and body spines as well as pulsatile body movements to reach their destination. Larvae may vary in size from 0.8-5mm in the first stage to 31mm in length in the 3rd stage. They can however also migrate via the blood system from the eye to the heart and then back to the lungs, trachea and via the soft palate to the nasal passages where the moult to 2nd stage larvae. The larvae can overwinter in the host so the larvae are not exposed to the harsh winter. 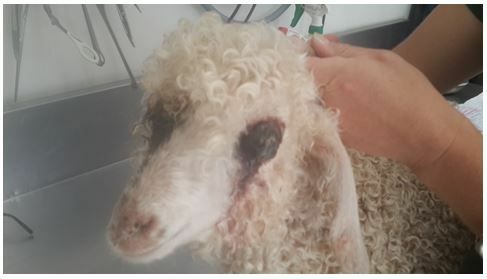 In preferred hosts there is little reaction but in abnormal hosts such as the Angora goat the life cycle cannot be completed and considerable pathology results from the migration of the larvae. The migratory routes are primarily intravascular but extravascular routes occur primarily along the optic nerve and other nerves of the head may be used. The ophthalmic form which is a specific oculovascular myiasis called bulging eye disease or "uitpeuloog".This ranges from a mild inflammation to a very severe exophthalmia with protrusion of the eyeball. The encephalitic form results in a variety of nervous symptoms depending on the damage caused by migrating larvae. The cardiac form can result in death due to heart failure. Usually an outbreak occurs where a number of animals infected. In the case of the flock of Angora goats 7 goats become infested in late March. 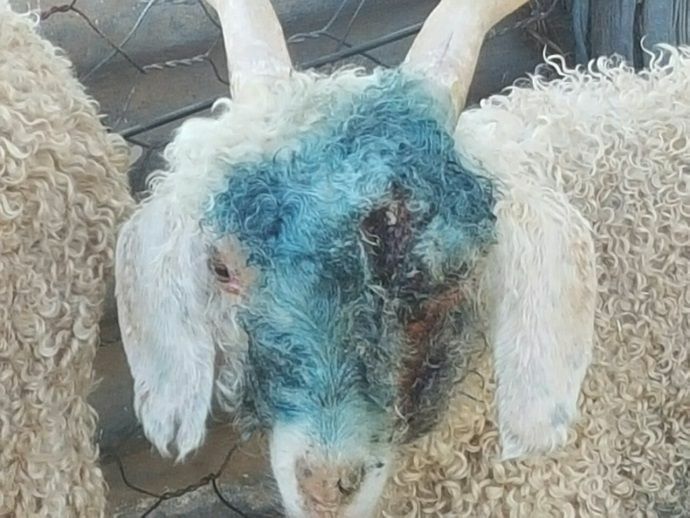 Patholgy findings in the Angora goat suspected of having been infected by Gedoelstia. fistula formation of frontal sinus which had become maggot infected. Inflammation and haemorrhage of duramater. Duramater: focus of macrophage infiltration in the dura with mild haemorrhage. Conjunctiva: Area of extensive severe inflammation with fibrin exudation. Marked granulation tissue development and neovascularisation and haemorrhage. Thrombosis and haemorrhage was also noted. Eye: neutrophilic exudation beneath the retinale vitreous contained homogenous eosinophilic material, neutrophils and haemorrhage. Goats should be removed from flock and isolated. Supportive treatment of shade, food and water must be provided. 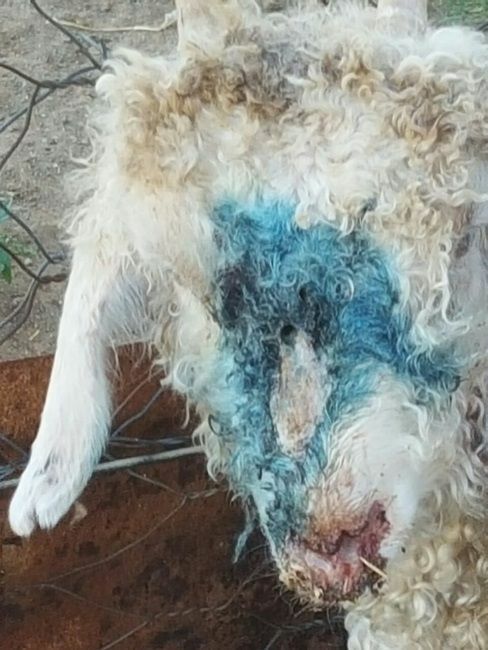 Spray the heads of Angora flock with a pyrethroid containing dip/spray to keep flies away and reduce the spread within the flock. Affected eyes can be treated with a cypermethrin spray which is effective in killing the larvae on the cornea and conjunctiva. Topical eye treatments and pain relief will help with secondary pain, inflammation and infection.